Impact Hub, a co-working space in Northern Liberties. 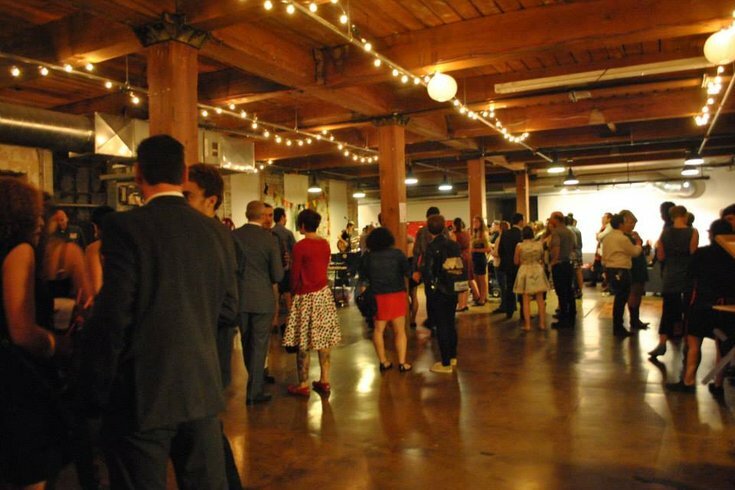 This Friday local artists will gather to show off their work at Impact Hub in Northern Liberties. The Second Annual theme-LESS Art Showcase is just that: an exhibit which uses no theme or motif to connect the art of its participants. Instead, the art speaks for itself. Shake Shack, Yards, VisionLine Media, Reynolds Consulting Solutions and ShirtCitizens have all sponsored the exhibit and will be present at its opening reception Friday, Aug. 7. Webjunto, New AM and Hope's Shirts will be there, too, and Shake Shack will debut its "Coffee and Donuts Concrete" treat for attendees. Live music and entertainment make the entire night a party. Alexis Walker, whose work will also be shown during theme-LESS, brought together the contributors and partnered up with local service organization The Village of Arts & Humanities which, it states, "supports the voices and aspirations of the community and inspires people to be agents of positive change through programs that encompass arts and culture, engage youth, revitalize community, preserve heritage, and respect the environment." The exhibit will also include the work of Oluafemi, Eleanor Day, Sharon Leshner, Ock Dilla, Carlee Myers, Nick DeBenedictis, John Gummere, Tieshka K. Smith, Tilghman Bros., Ashleigh Staton, James Raymond, Lacey Kerchner, Priscilla Bell and Dave Blanch. After the opening, the art can be viewed Monday through Friday at Impact Hub between 9 a.m. and 7 p.m.